Interesting Antique Textiles: You can never have too many boxes, especially pretty vintage French ones like these! 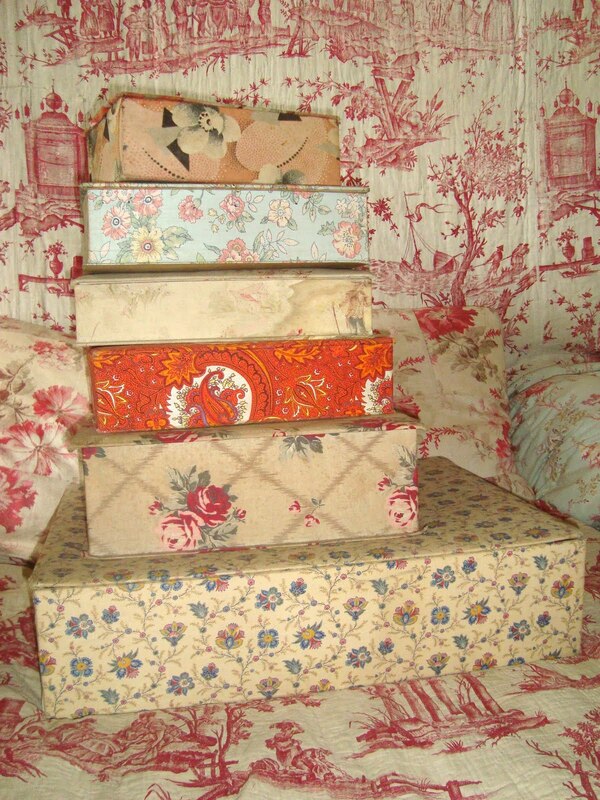 You can never have too many boxes, especially pretty vintage French ones like these! These beautiful vintage & antique French fabric-covered boxes make eye-catching storage solutions if you are like me and have far too much clutter! They are yet another way to bring flowers and prettiness into the home. Some of these will be for sale in my website later today, and hopefully more to come as I go buying again now the Spring is almost upon us. I just love fabric-covered boxes too. What is that beautiful toile that you have in the background? Its a gorgeous toile de Nantes, called Panurge dans l'iles des lanternes, I think it dates to about 1785 and was influenced by the designer Jean Pillement. The designers Robertson Mead have made a modern copy. It is a real inspiration to me, one of my favourite pieces! So glad I found your blog through The Cloth Shed. 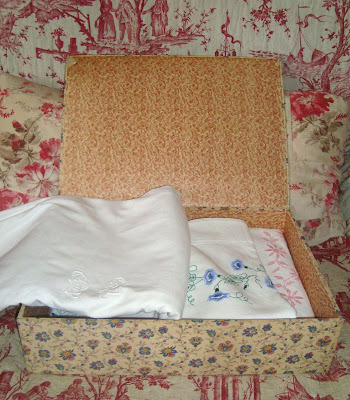 Your pictures and fabric boxes are beautiful. I love the one of the seated lady accepting a flower from her gentleman friend... so charming.